Resources developed by the School of Life Sciences Schools Outreach team with scientists from the division of Molecular Microbiology. Magnificent Microbe teacher notes: An overview of the Magnificent Microbes project and ideas on how to make your science topics cross-curricular. Microbial Handprints: Students use agar plates to discover the microbes growing on their hands; includes guidance on collating and graphing results. Handwashing Exercise: UV reactive gel helps students visualise how easy it is to pass microbes from one person to another. Yeast Races: Find out which food source yeast likes best in a hands-on experiment. Growing Mould on Bread: Test surfaces around school and home using bread as your growing surface. Model a Microbe: Use your newfound knowledge to create a new microbe and write a news story about it. Bacterial Growth: How do bacteria reproduce? Learn more and try some tricky maths questions here. Relative Size: How big is a bacterium? What about a virus? Compare these to other types of cells and other common objects. Making Microbes Work: What do microbes do for us? An investigation into the uses of microbes in our everyday lives. The following resources were developed to support the Great British Bioscience Festival. SLS researchers and PhD students attended the event to present 'Bacterial Cities', an interactive hands-on stand exploring the world of bacterial biofilms, to over 7000 people. Biofilms teacher notes: An overview of the Bacterial Cities activity and background information on biofilms. Includes suggested classroom activities. Biofilms student sheet: Question sheet all about biofilms and bacterial growth. Heroes vs Villians: The Restless Battle. 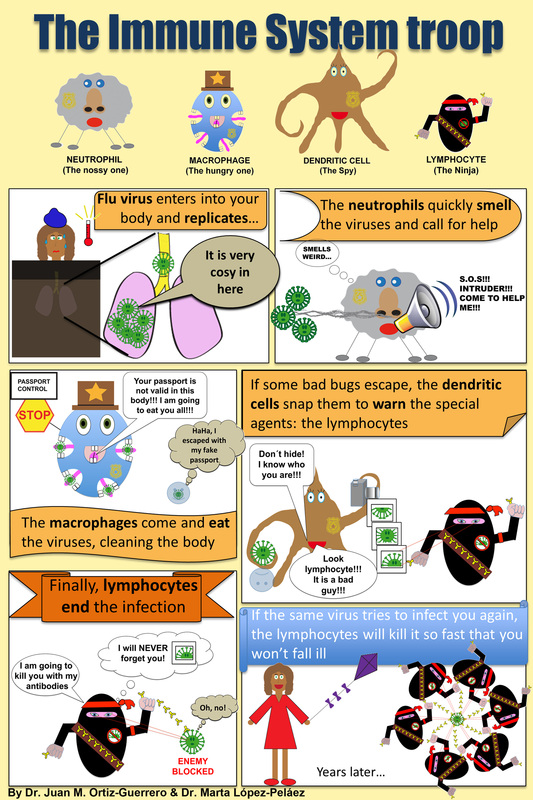 A well-rounded resource about the immune system in action complete with poster, explanitory comic and interactive card game suitable for ages 8+. Created by Marta Lopez Pelaez and Juanma Ortiz-Guerrero from the MRC PPU. How can scientists quickly and accurately tell cells apart? With technology, of course! Learn a bit about flow cytometry and try your hand at being a cell sorter yourself. Can you beat your best time?